6.75" Football Monster Trophies. For the scorer or destroyer in your group. 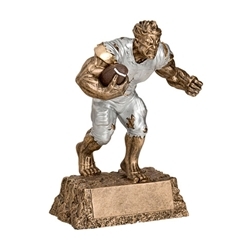 This unique award is perfect for MVP, Best Offense, Best Defense, Flag, or Fantasy Football Award. We now have an option to add a 2" high black marble base or 4" high walnut wood base. Logo option only available with additional base. Order additional name plates to use as a perpetual trophy by also ordering item #NP100. Recommended size .75" x 2".